One of the key exhibits in the V&A’s new exhibition Fashioned From Nature is a 19th century French hat decorated with a stuffed starling. 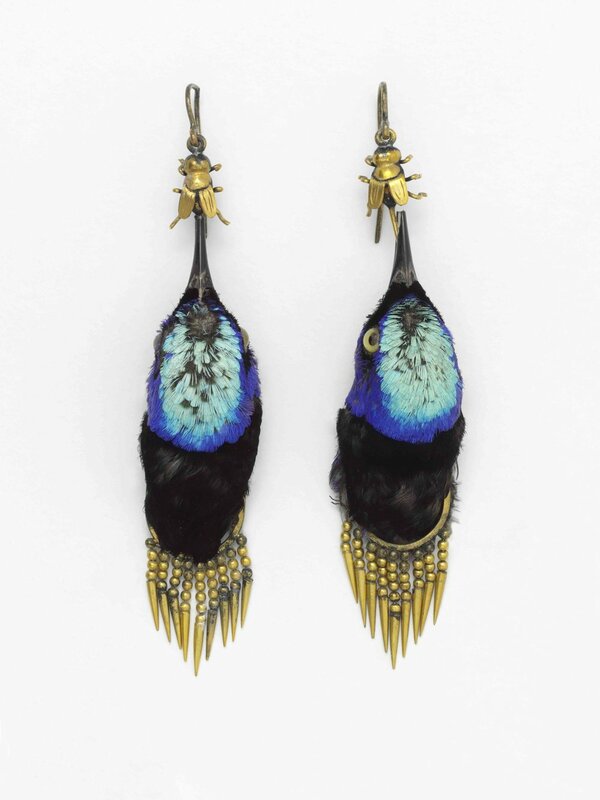 Nestled in a bed of painted goose or swan feathers, the little bird’s own modest plumage is mixed with dyed feathers from more exotic options. 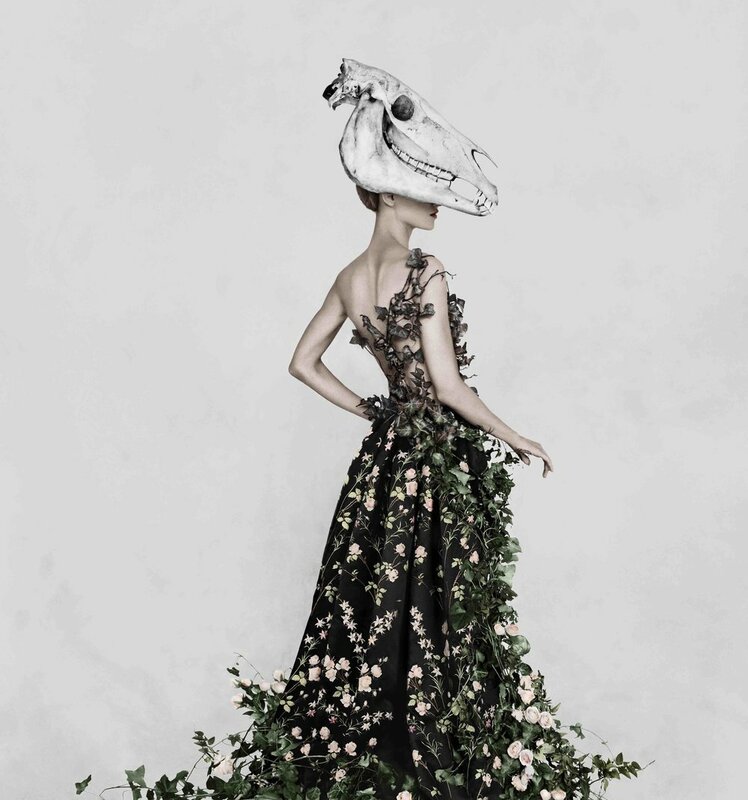 Set to be one of the V&A’s most seminal exhibitions yet, Fashioned from Nature traces the complex relationship between fashion and the natural world, from 1600 to the present day, through 300 beautiful, often deeply unsettling objects. The word ‘complex’ here is an understatement. At its most innocent, the exhibition shows how fashionable dress repeatedly draws on nature for inspiration. In the 17th century mens waistcoat embroidered with a pattern of playful Macaque monkeys and a woman’s jacket from the 1600s, decorated with pea shoots and flowers; in Giles Deacon’s bird egg-print couture and the dress from Alexander McQueen’s Plato Atlantic collection, wearers are turned into Pans and Floras, embellished and enhanced by association with the natural world. At its most tragic, however, the exhibition demonstrates the devastating impact of fashion on the natural world, through grotesque trends for animals skins to the intensive processes of today’s voracious - and ever expanding - industry. Alongside the 19th century dress crafted from thousands of iridescent jewel beetle wings sits a photograph of a very beetle the garment was decorated with; ditto the display in which the stuffed stoat gazes blankly over a magnificent 18th century court dress from Mantua, its bodice decorated sewn with ermine tags, the tail tips of the animal’s long dead compatriots. Time and again, in photographs and artefacts, the visitor is reminded that, in making many of these exquisite items, equally - if not more - exquisite beings lost their lives. Plucked from their natural habitats, and from life itself, the starling, the beetles, the stout, become symbols of the most destructive sides of fashion’s fascination with nature. This is where the exhibition is at its most contemporary. Gone is the notion of the fashion exhibition as a parade of outfits, waiting to be feted for aesthetic appeal. Instead, Fashioned From Nature reconnects the viewer with the most important part of any garment: its raw materials. “I’ve been a fashion curator for over 30 years and I’ve always wanted to do an exhibition about the way fashion interacts with nature,” explained Ehrmann at the launch in April. “[At first], it was much more about the inspiration fashion gets from nature but [then] I felt this approach was just no longer viable. It’s curious, I mention to Ehrmann, how humans appear to venerate nature, on the one hand (in order to create a pair of earrings from the heads of honeycreepers, or a cape of cockerel feathers, you must think them pretty) while facilitating its slaughter on the other. It’s not all doom and gloom. Move upstairs and the narrative brightens, through the work of designers dedicated to new ways of making clothes. Here, the visitor encounters work by ethical pioneer Stella McCartney; award-winning designer, Christopher Raeburn, who creates functional fashion from military surplus; Bruno Pieters, former design director of Hugo Boss, founder of the one of the first fashion website’s focussing on transparency, and any more. Spirits continue to lift. The idea of the circular economy, where waste becomes resource, is celebrated in its most dramatic form, in the Calvin Klein gown and train created from recycled plastic bottles and worn by Emma Watson at the 2016 Met Gala. Recycling and up cycling help answer the issue of waste. Meanwhile, alternatives to other resource-heavy materials such as plastics and nylons are also emerging. Here, Ehrmann positively revels in a plethora of new ideas including a dress grown from plant roots by artist Diana Scherer, who uses seed, soil and water to train root systems into textile-like material, and a bio-luminescent genetically-engineered silk dress created by Sputniko!, the MIT Lab and the National Institute of Agricultural Science in South Korea. To replace leather, now increasingly recognised as toxic to people, planet and the animals whose bodies it is taken from, scientists provide plant-based equivalents - from grape waste and pineapple fibre to mycelium (Bolt Threads’ dynamic collaboration with McCartney). The exhibition doesn’t stop at examples of fashion, good and bad. A ‘Protest Island’ celebrates the dynamic political voices of activists such as Vivienne Westwood, Katharine Hamnett and Fashion Revolution. Two installations Future Now and Fashion Future, developed by the Centre for Sustainable Fashion, ask the visitor to explore the hidden impact on nature of five iconic fashion pieces and to imagine what the future of fashion might actually look like. Exciting and utterly prescient, the exhibition’s multi-dimensional approach both stimulates and - hopefully - inspires change. Ehrmann is once again musing on the starling hat. “It’s an example of the human urge to improve on nature ….” she muses. What people are starting to realise however - and what the exhibition is implicitly suggesting - is that nature is very hard to improve on. Humans, on the other hand, have some way to go. Fashioned from Nature, supported by the European Confederation of Flax and Hemp - CELC with further support from G Star RAW, is on at the Victoria & Albert Museum till January 27, 2019.